Accord 10 x 6 Light Oak Return Air Grill Discounts Apply ! These oak vent covers come in a 10 x 6 size and are pre stained in a light oak finish. Our return air vents are made from a North American red oak, which will look great in any home. Use the oak vent cover on your wall or ceiling to cover up unsightly duct openings. The return air vent does not have a damper on the back but simply has a open faceplate. Use the oak vent cover as an air supply or return in both hot and cold air conditions. These return air vents have two pre drilled holes on either side of the faceplate and come with mounting screws. ***Hint: To order the return air vents correctly, you must measure the actual duct opening in your wall. The 10 x 6 oak vent cover will cover a hole of that size. The dimensions of the faceplate dimensions will vary. Unfinished return air vents are also available for purchase in the 10 x 6 size for those who would like to apply their own stain. 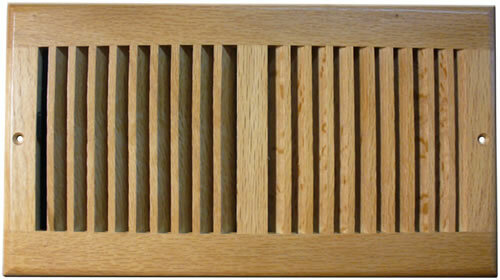 Our oak vent covers are a beautiful option to replace your current metal return air grilles. Call or click to order today!